So apparently it's up for pre-order on Gamestop? Price $250 and will be released next year it says. "Castle Grayskull was built to protect an unknown source of power - and now you can too! 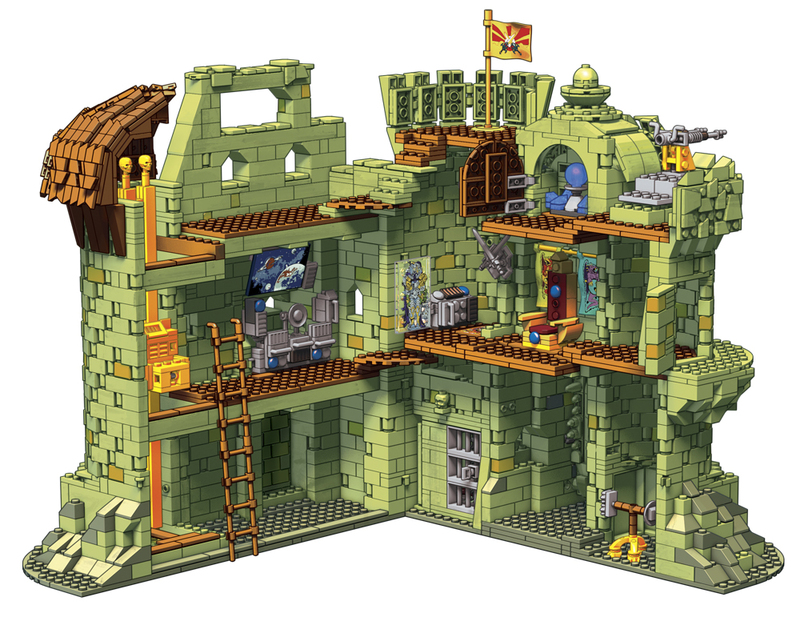 Discover all of Grayskull's mysteries when you assemble more than 3,600 pieces to recreate this authentically-detailed and completely faithful castle. Grayskull opens wide to reveal working weapons and launchers, a throne room with surprises, working elevator, and drawbridge that opens and closes. This collectors set also includes 6 micro action figures: He-Man, Skeletor, Man-at-Arms, Teela, Beast Man, and the exclusive Sorceress! Ideal for ages 10 and up. It looks amazing! And complex! Maybe 1200 pieces? Any Lego experts care to estimate? I hope Game Stop is in business long enough to fulfill a 2020 order... .
Lego is about 10c a piece for a licensed theme. The link does not work. Also I saw the listing on GS.com and there no photo. WTF?! It is a bricks reproduction of the MotUC castle...!? Disappointing doesn't even begin to express it. How could they drop the ball like this? Was this really their idea of "everything fans wanted" from a MCX Grayskull?? For goodness sake, if I wanted another clamshell, I'd go buy another MotUC Grayskull. This was our one and only chance to ever have a true fully three-dimensional castle with all four sides and a full interior, but they gave us... THIS!? I'm sorry I'm not dropping several hundred on this. It falls short of even my lowest expectations by a long margin. Last edited by uaxuctum; February 11, 2019 at 06:14pm. To be fair bricks do give at little at bit of realism. I do agree though it’s a bit pricey. Actually, I really like it for what it is. But I get that anybody expecting a 4 walled Castle would be completely disappointed. In the grand scheme of things, I am very impressed. Why? To think that after the death of the 80s line, we would see 3 more MOTU lines with 3 more Castle Grayskulls is pretty damned crazy. Last edited by DC_WARLORD; February 11, 2019 at 06:59pm. A brick version of the vintage Grayskull is pretty much what I expected. That minifig selection sounds good! 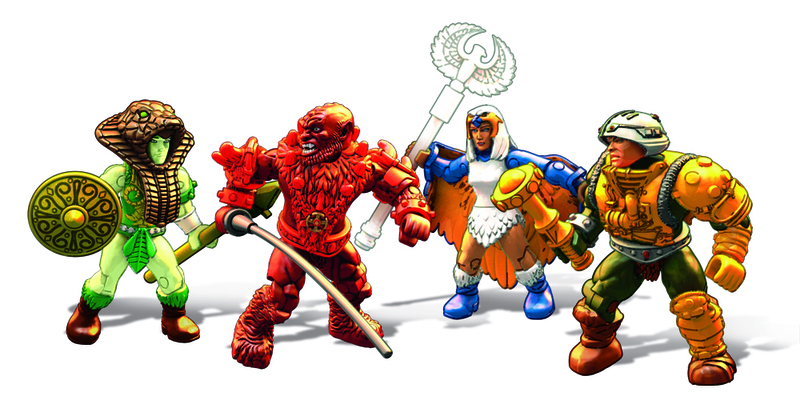 Goddess, red Beast Man, and a Man-at-Arms that looks very much like it's leaning toward the Alcala version makes me think He-Man and Skeletor are probably Alcala-style versions, as well! Too bad there's no blue Mer-Man. Don't forget the Sorceress! I am actually digging this castle! So excited for this! I will buy it. I won't preorder it yet. I'm sure others will carry it (like BBTS) and perhaps for less. I'm gonna wait to see if BBTS gets it. This playset is to scale with Mega Construx figures. The TMNT Technodrome Star Trek bridge cost less, but that was a few years ago now, and those were probably produced in larger numbers - at least the Technodrome, given the existence of TRU. If this is what two sides cost us now, imagine the cost of 4 sides. It would be crazy. But this thing takes a lot of plastic to make as-is and will be heavy. I'm just disappointed in the character selection for the figures. No King Grayskull of any kind? No Astronaut suit? Add me to the list of those hoping BBTS lists it for pre-order. we're not allowed to use four letter swear words on this forum so I will kindly just smile and nod at this news. Very nice. Hope other playsets, figures and vehicles are following. The price is a bummer though - especially when I take shipping and customs for an oversea delivery into account. If the price drops, I'm definitely in. In 2016 there was a Mega Bloks U.S.S. Enterprise NCC-1701, piece count of 3098, and was a total build that made for a satisfying challenge, looked great, and was a suitably impressive size and weight. It too was $250 but dropped in price to about half that a year later, and has been consistently priced at $100 on Amazon. I'll probably splurge and get this castle when it's new and pay Amazon's price for it whenever it gets listed over there, rather than wait a year for a price drop. In my case, I'm judging from past experience of having built a big-ticket Mega set and loved doing it, so I'm sold. Natch, this will be a great castle ... but $250 great? I think so, but for those who aren't sure, I'd say exercise some patience and wait for retailers to drop the price later. Now, the whole point of building sets is that it's up to you to build it. What if you don't follow the instructions and decide instead to make a four-walled castle with any interior or exterior characteristic you want to give it? Given that you have the pieces on hand of course, more power to you, it's not like the Toy Gods will banish you to Despondos for not sticking to the intended build. If there's any toy form factor where you have the maximum freedom to make the toy your dream version, no matter how much that dream version differs from the picture on the box, this is that form factor. This is your chance. Mattel/Mega has to pick SOMETHING as the intended build, though, and I think they made the right choice by approximating the vintage and MOTUC look. I'm just disappointed in the character selection for the figures. No King Grayskull of any kind? No Astronaut suit? This! We need that suit!! And the weapons rack!! King Grayskull could be an expansion character set. Yes!!!!! Now He-Man has a place to park his Wind Raider. Is it just me, or does it look like they plan on making Beast Man Red? If so, its good to see them change him up a little. I like how the trap door drops into the prison. Seems like that's how it should have been done originally. It kind of looks like its' modeled after the Classics version of Castle Grayskull. $250 is expensive, but I'll gladly pay it. I really love this line. I had a lot of fun putting the Wind Raider together, so I can't wait to have 3,600 pieces of Grayskull spread all over my dining room table. $250?!?!?! MOTUC Grayskull seems like a bargain now! Put scale into the equation here...this thing is probably only about 8 1/2" tall. Hopefully I'm wrong. As much as I love this line, that price is really insane.